Yuika came over to have lunch and hang out. 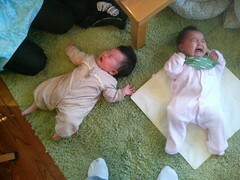 She and Tonchan demonstrated their synchronized crying abilities by screaming in stereo. 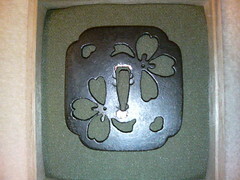 Yamazaki-sensei sent Tonchan this beautiful tsuba of flower petals and hearts. This will have to go on her first sword, as soon as she's big enough to start cutting! Headed down to Tokyo Bay coast of Chiba for our annual gasshuku "stay and play." Met the gang at Tokyo Station and to the train for about 1.5 hours to Iwai Station, a nothing little town on the Chiba coast. During the summer the place is packed with sun and sea seeking tourists, but on a cold, rainy February day it's as dead as you can imagine. Some tried to get lunch at one of the two restaurants by the station, but the rest of us bought bento in Tokyo so we walked down to yado and ate. Denjirokan is a traditional minshuku. Cheap, old and kinda rundown. The kind of place used by student groups and the like. We numbered 40 so they just gave us run of the main building; two floors of a series of interconnected tatami rooms, piles of futon, and bathrooms at the end of each floor. Communal bath (boys and girls separate, each seats about 5 at a time) was across the driveway, by the dog house. Communal dining room seats about 80. Staying in the other building was a school karate team who used the small gym to train. We got the larger town gym down the road. After checking in we piled into the minivan and went to the gym to train for a couple of hours, then back to Denjiro for a quick bath and change before dinner. As this was a beach town, the fish and seafood was fresh and delicious and we stuffed ourselves silly. I was pretty tired and had my own room (one of the benefits of being a sensei) so I went to bed early, but from the noise of things they carried on well into the morning. At 5:30 am I stomped around the building waking everyone up to do some zazen. Nearly everyone came down and trudged through the dark rainy morning to the freezing cold small gym for a couple of short sittings before breakfast. Then we went back to the big gym and trained for a couple more hours before calling it a day at noon. We mainly did kumitachi, with me teaching the beginners group and trying to plow through as many kata as possible in two days. I think everyone had fun and there was minimal damage done. We had a good hour before our train arrived so again we piled into the only two restaurants in town. The old grandma running the small pub snack was flabbergasted when we arrived and we just asked her to make whatever she could, so she produced some rice pilaf and curry bowls and we took matters into our own hands, helping ourselves to all the bottled beer. By the time we made it back to Tokyo the sky was beginning to clear.